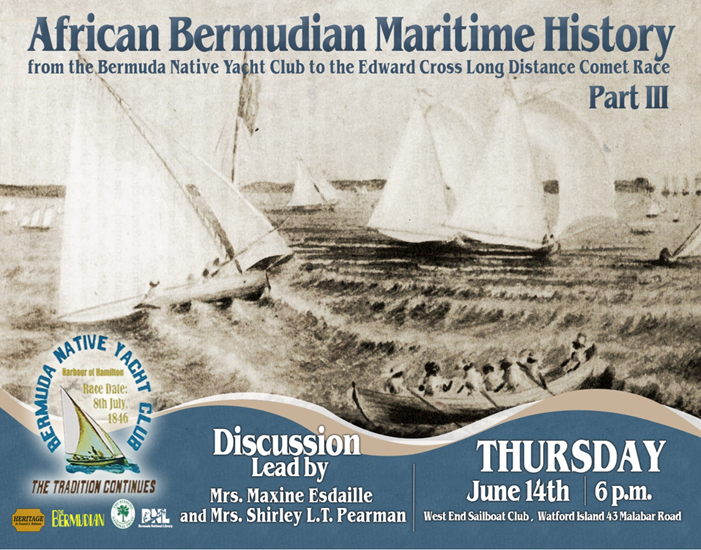 Shirley Pearman and Maxine Esdaille will give a presentation on African Bermudian maritime history in the lead up to the Edward Cross Long Distance Race on Thursday, June 14 from 6.00pm to 8.00pm at the West End Sailboat Club. A West End Sailboat Club spokesperson said, “The interest in learning about Bermuda’s maritime history continues as Shirley Pearman and Maxine Esdaille have been again asked to present on African Bermudian maritime history, this time Part 3 at the West End Sailboat Club in the lead up to the 74th annual Edward Cross Long Distance Race. “The annual long distance race takes place on Monday 18th June 2018 and Mrs. Esdaille and Mrs. Pearman will make their presentation at the club on Thursday 14th June at 6.00 – 8.00pm as a part of a number of events being hosted by the West End Sailboat Club next week. “The first time these ladies made their presentation at the Bermuda National Library on 13th June 2017, Mrs. Shakir, who organised the event on behalf of the Library, was overwhelmed by more than 50 persons who attended the event. “On Thursday evening, 14th June 2018, between 6.00 – 8.00pm, West End Sailboat Club will host African Bermudian Maritime History Part III. The impetus for the original presentation was the fact that Mrs. Esdaille discovered that the Bermuda Native Yacht Club was the first yacht club formed in Bermuda and this club was formed by African Bermudians in 1844, just 10 years after Emancipation. “This led to a collaboration with Mrs. Shirley Pearman, whose father was Dr. Kenneth E. Robinson, author of Heritage, a book that was a major source for research into to the topic. The Bermuda Native Yacht Club was the main focus of the first presentation. “But African Bermudians have had and continue to have an impact on Bermuda’s maritime history, so the second presentation shared other aspects of our maritime history and included information about the founding of the Blue Water Angler’s Club. “At the second presentation, just like at the first, not only did the presenters share the story of African Bermudians and the sea, but audience members shared stories of their families involvement in Bermuda’s rich maritime history. At the Library in June 2017, a number of persons shared their stories about their or their family’s involvement in Bermuda’s maritime trade from Somerset to St. George’s. “One such person was Mr. Raymond Deshields, who built the full-size replica of the Deliverance on display in St. George’s. 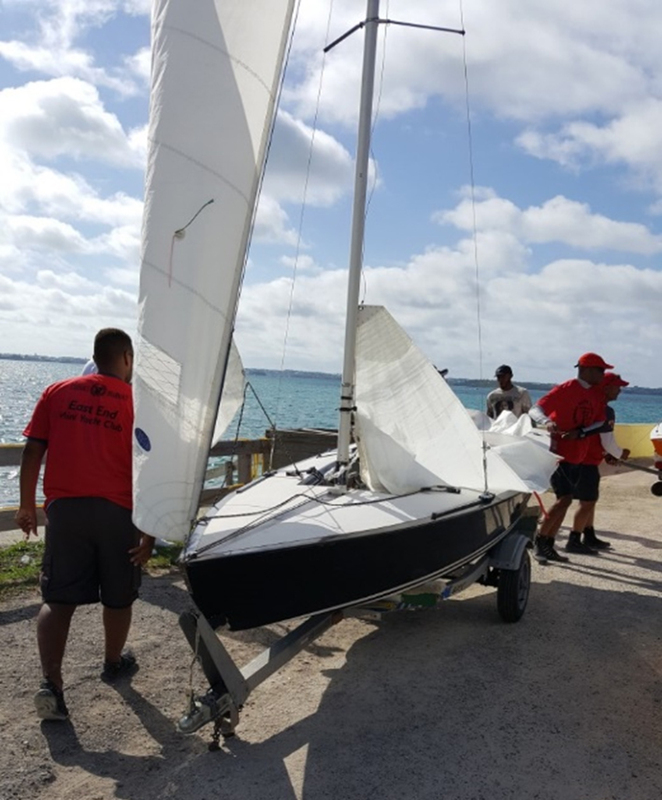 At the Blue Water Angler’s Club in November 2017, Senior Branch Pilot, Mario Thompson shared the fact that young Bermudians continue to be involved in our maritime industry and that many are sailing on international boats of various kinds, including cruise ships. “The presentation on Thursday 14th June at the West End Sailboat Club is free of charge and will continue the story adding additional research of the African Bermudian impact on our maritime history and future. Included will be background to the Edward Cross Long Distance Race – who was Edward Cross and why does the Race bear his name? Also like the previous sessions, the audience will be invited to share their involvement in our maritime industry. “Additional happenings at the West End Sailboat Club in the lead up to the Race on Monday will be a Happy Hour and Barbeque on Friday 15th June. On Saturday there will be an Oldie Goldie Dance with DJ Steele and on Sunday, which is Father’s Day, the Club takes the time to honour those members who have passed on with a Memorial Service to be held at the Club starting at 9.00am. Following the Service there will be a Codfish Breakfast. “The big day is Monday 18th June with the Edward Cross Long Distance Race, leaving East End Mini Yacht Club this year. Those who want to ride along with the race can catch the official boat leaving Albouy’s Point at 8.30 am or from Watford Bridge at 9.30am to St. George’s and follow the Race coming back to West End Sailboat Club. The cost for the round trip is $60 and includes lunch. “The Race Committee is pleased to report that Caesar’s Pharmacy has again this year donated team shirts for each of the boats in the Race. Shirts are in team colours so people can spot their Club’s entry based on team colours. Team colours this year: West End Sailboat Club – green, Mid Atlantic Boat Club – royal blue and East End Mini Yacht – light blue. I am very pleased to see this and we must bring this presentation to St Georges. I know that the African contribution to the success of the Bermuda maritme trade was equal to whites in boat building, ocean trade, privateering etc. Read Dr, Jarvis’ book IN THE EYE OF ALL TRADE 1680 TO 1812 and you will understand what I mean..